When taking on the extraordinary variety of challenges that are presented by a water damage catastrophe, there is no one more skilled and prepared than the water damage Decatur experts with 911 Restoration Atlanta. 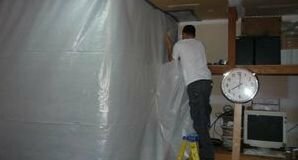 Our specialized technicians know all there is about the world of water damage invasions, and in their tenure they have come to realize that the best way to prevent increased loss is to get to the scene of the event quickly with the right tools. This effort is why our professionals will arrive within 45 minutes of any call for help, at any time of the night or day too. Moreover, our experts are also available 24/7/365 so that whenever a leak springs, or a puddle forms unexpectedly, we will be there to eliminate it in the most fastidious manner possible. If your home or storefront is already amid a flowing black water catastrophe, then don’t wait another minute to contact our water damage Decatur team with 911 Restoration Atlanta for the best help available today! Our specialists know every aspect of the world of water damage and how to fix such situations after they have already taken place, but they are also highly proficient at helping people to prevent such incidents altogether. Take the time to trim the trees around your home or office so that if there are any protruding dead limbs, that they don’t fall down and cut through your roof when under heavy rains or high winds. Make the time to inspect your pipes at least once a year or so to find any rusting or corroded sections that need replacement. Never insert anything into your plumbing system or septic field that it was not designed to handle with ease. This can include multi-ply products as well as those that claim to be biodegradable too. Clean out your gutters at least once a year so that you can avoid any clogs or obstructions that may become overflow creators which then infiltrate your roof with seeping water. Have a plumbing or restoration professional come and inspect your system once every few years to catch any small situations before they grow and become larger ones. There are plenty of other ways to keep your home safe from the ill effects of water damage, and this is not a final list, so if you have questions that aren’t listed here, then contact our experts for more information. Don’t let your gorgeous home succumb to the effects of a water damage invasion without help from the experts. Contact our specialists with 911 Restoration Atlanta and let us help with all of your needs today! Our customers are our main priority, and this is why we make sure to always put their needs as job number one in everything we do. We ensure that our customers are extremely well-informed every step of the way, and that is why we walk our clients through all phases of the restoration endeavor. Moreover, we make sure to use only the most advanced drying technology and extraction equipment so that we decidedly eliminate all traces of moisture from your structure. In concert with our capacity to arrive early and give our clients the best services in the industry, we will also go the extra mile for our customers to help them with their insurance paperwork too. We don’t want our customers to have too much to deal with all at once, and so we try and help with as much as possible to make life easier. If your home is already amid a flooding event of any kind, then don’t wait another minute to contact our water damage Decatur experts with 911 Restoration Atlanta for help and a fresh start today!